Editor’s Note: This is the third of an exciting four-part series here on The Middle Spaces—co-organized and co-edited by Joshua Kopin—a round table of fifteen different scholars discussing the intersections of sound and comics (and sound in comics). Be sure to also go back and read parts one and two if you haven’t. Full bios for all our contributors can be found on the Guest Writers page. Our round table continues today with four more scholars asking questions, this time about the politics of silence and gender, indigenous representation, and language. Does the representation of sound in comics reify the continued stereotyping of transnational indigenous lives? In 1984 and again in 1985 Chris Claremont and Barry Windsor-Smith joined forces to explore the X-Men’s Storm, who had recently lost her powers. The second of these stories, “Lifedeath II” (The Uncanny X-Men #198), shows Storm travelling through the east African desert and meeting Shani—a young, very pregnant local woman who only appears in this issue—in the remains of a car crash. Rescuing her, Storm returns Shani to her village. In the issue’s climax, Windsor-Smith composes two pages that entangle scenes of Shani giving birth with scenes of a tribal dance ceremony meant to offer Shani and her coming child strength. 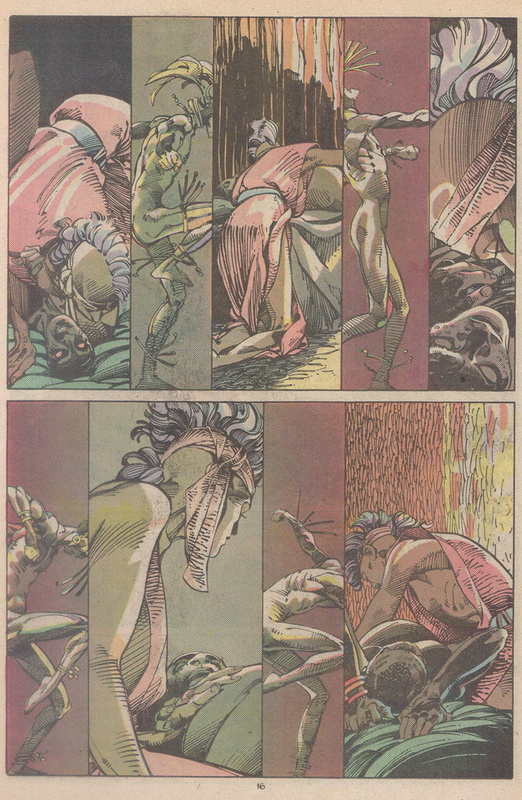 As Osvaldo Oyola notes in “Imperfect Storm (Part Two): Exploring ‘Lifedeath II’,” “The layout of the panels provides a sense of rhythm that evokes the musicality and desperation of the conjoined scenes (in a way that only sequential art can accomplish).” The long, narrow panels create a rhythm that corresponds both with the dance and with the breathing and pushing of labor. The lithe bodies of the dancers appear to move and stomp to an unheard drum. Two panels at the bottom of the page showing Storm aiding Shani are widened slightly, slowing the visual rhythm, evoking a longer push and the anticipation of the coming child. The narrow, visually staccato panels continue on the next page, though instead of a parallel between Shani’s labor and the dance, there is a rhythmic parallel between the dance and the CPR Storm administers to the unbreathing newborn. Within these two pages, readers might not pay attention to the scarcity of represented sound until the appearance of dialogue on the second page. At any point that the dancers appear, there are no explicit representations of sound. Of course, sound is a part of the diegesis here, and this scene is full of sounds—the music, the dancers, the sounds of labor, talking and moving throughout the village, etc. However, Claremont and Windsor-Smith only offer a visual indication of rhythm while leaving out any explicit signifier of diegetic sound. Shani crying out for her child highlights the non-diegetic silence prior. The scarcity of represented sound in the face of a plenitude of diegetic sounds creates a gap between what readers see and what they imagine hearing in relation to the visuals. The relationship between sonic scarcity and plenitude operates in tandem with both intratextual and extratextual signifiers via what Jodi Byrd (Chickasaw) has called “cacophony.” According to Byrd, cacophony is made up of “discordant and competing representations of diasporic arrivals and native lived experiences.” The scene becomes cacophonous in this gap, where readers draw on signifiers both inside and outside of the comic to fill in the sounds that are not represented. Within the comic, there are plenty of signifiers to add to the cacophony. For instance, Shani’s village is never named; instead, we just know that it is somewhere in East Africa, a large and culturally diverse area. The lack of a specific locale or tribal community tied with the variety of visual signifiers—the large fire, the nearly naked bodies of the dancers, the tassels and feathers—all work together to create a sequence rife with opportunities for sonic stereotyping. The scarcity of represented sound carries various significations depending on the contextual knowledge of the reader and their larger understanding of several socio-cultural contexts depicted. Because East Africa is such a broad and heterogeneous descriptor and because a primarily North American audience has specific understandings of indigeneity tied to the northwestern hemisphere—the latter of which is evidenced in the tendency to collapse all indigenous peoples into one group of “Native Americans”—this scene could become equated with the stereotypical sounds a reader heard on a “Plains Indian PBS show” once. Thus, while this portion of this story works in a way that only sequential art can, it is also problematic in a way that only sequential art is. Will Eisner highlights this problem when he writes, “The stereotype is a fact of life in the comic medium. It is an accursed necessity….” The representation of sound in “Lifedeath II” becomes a cacophony, a sign with too many referents composed of broad descriptors in the comic and “discordant and competing” understandings of indigeneity in the reader. Non-diegetic silence composing diegetic sound, especially the sounds of marginalized and/or indigenous communities, creates a different sort of cacophony than that of beating drums, hurried conversation, and the strains of labor. Instead, the cacophony of “Lifedeath II” is that of stereotypical understandings of indigeneity, which becomes marked by short-sighted and overly general understandings of the heterogeneity of transnational indigenous communities in that silence. What might representations of sound in Marvel’s Dazzler comics reveal about the dangers of silence for women? In 1977, Audre Lorde discussed her experiences with cancer, saying: “My silences had not protected me. Your silence will not protect you.” She went on to emphasize that all of the women who sustained her at this time shared a war against the “tyrannies of silence.” Lorde’s writings have become essential to queer and feminist canons, and I invoke them here as a framework for thinking about women and silence in comics. Specifically, I want to examine what Marvel’s Dazzler (Alison Blaire) might reveal about the “tyrannies of silence” that challenge visible and outspoken women. The idea that “silence will not protect you” becomes a theme for Alison, who is endangered whenever there is no sound to fuel her powers. Conversely, her mutation serves as a positive metaphor for speaking up and its ability to shed light (literally!) on issues that get silenced by patriarchal power. 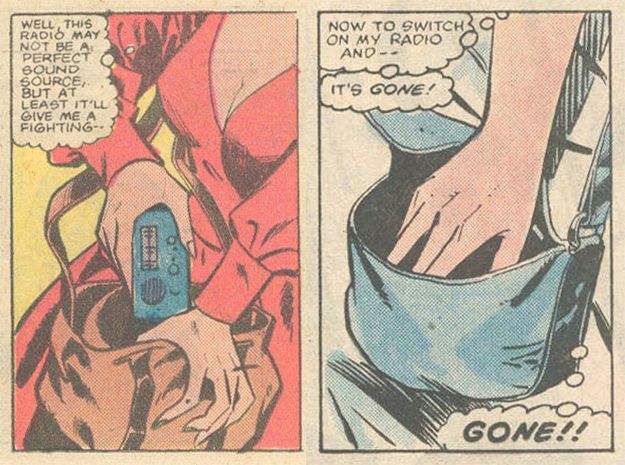 Moreover, regular depictions of a portable radio player in her purse demonstrates how the dangers she faces are gendered; the device stands in for pepper spray, a whistle, or other protective technologies often found in women’s bags. On occasion, Alison reaches into her bag to find the radio missing or broken, and she worries. The danger of silence here reminds us that women are often expected to travel with protection. This is made explicit in Dazzler #18 (1982) when Mister Fantastic builds Dazzler a new portable player that amplifies her powers. In that same scene, the Invisible Woman explains to a frustrated Alison that “Reed made this for your own good.” Such a declaration highlights the idea that such a device serves as protection, while also invoking the lengths to which men will invent technologies to protect women from assault rather than work to prevent the assaults themselves. 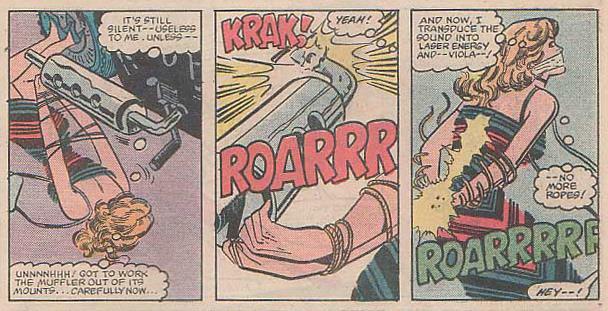 Alison’s inability to speak up is presented as a danger in multiple storylines, including a confrontation with Enchantress in Dazzler #16 (1982) in which the sorceress casts a silence spell upon Dazzler, one that Alison describes as keeping her from “speaking or […] acting to save myself.“ Later, in Dazzler #23 (1983), Alison is bound and gagged, and must remove a muffler from a motorcycle to access her powers. The villain in this issue (Flame) explains that the muffler is “elegant and efficient” like him. As such, it serves as a visual cue for the patriarchal silencing mechanisms that threaten her. These narratives become more striking when read alongside Dazzler: The Movie (1984). I have written about the #MeToo politics of this graphic novel previously and will not rehash those arguments here. Instead, I want to highlight that Dazzler is not only endangered by her silence but perceived as threatening for how she speaks out. When she participates in a demonstration of her powers, her ability to absorb sound leads to a silencing of the jet engines and the crowds around her. This event makes her the public (and hated) face of mutantkind; she is feared for her ability to harness sound in ways that silence the very patriarchal system that sought to silence her. This fear typifies how outspoken women (particularly performers) are treated when they speak up. Last year, fifteen years after the Dixie Chicks spoke out against George W. Bush and two years after efforts to #BoycottBeyoncé, another “shut up and sing” narrative emerged as Taylor Swift shared her political beliefs on Instagram. Such narratives—in which celebrity entertainers are criticized for using their platforms to engage in political discourse—have become a recent subject of scholarship ranging from feminist studies and film studies to music studies and international relations. In the case of Dazzler, her fictional “shut up” moment arrived in Beauty and the Beast (1984), when she was recruited to perform in a gladiatorial underground mutant theater. 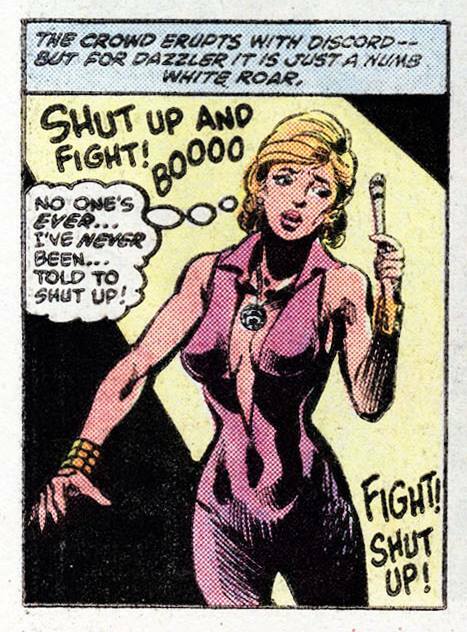 There, she chooses to sing for her audience instead of fight other mutants, which leads to calls for her to “shut up and fight”—a phrase that calls to mind the “shut up and sing” rhetoric leveled at contemporary women performers and recent demands that black athletes (e.g. LeBron James or Colin Kaepernick) just “shut up and play.” The implicit message, of course, is that they should not buck the system. Indeed, their status as entertainers and athletes apparently disqualifies them from fighting back; the argument is that their platform entitles them to fame and nothing more. Such stories remind us not only that silence cannot protect, but that speaking up will be seen as a threat by those who benefit from oppression. Dazzler’s early narratives are marked by this tension between being silenced and using one’s platform to speak up. How might we draw on that tension to account for future readers and writers who might look to Dazzler as a model for how to be an activist or an ally? I am thinking specifically about her recurring role as a performer at “Mutant Pride” events in Dazzler: X-Song #1 (2018) and Iceman #4 (2018). In other words, how might her character’s history inform how she has been (or might still be) portrayed as a voice that speaks on behalf of marginalized communities? And how might her highly-visible celebrity status affect both how and when she is depicted as vocal or outspoken? How does lettering color contribute to the representation of sound in comics? In graphic narratives, captions and text balloons convey (and constrain) the voices of the characters. Speech and thought balloons, however, can also contain other pictorial elements such as pictograms and sound symbolic forms or ideophones, defined by Pier Pischedda in “The Linguistic Rebel: Semantic and Syntactic Peculiarity in the Use of Sound Symbolic Forms in Italian Disney Comics” (2017) as “any forms that attempt to represent sensorial experiences in an iconic way.” The lettering in balloons and captions (and sometimes outside of them, in the panel or even the gutter) represents a crucial element that would otherwise be absent from the comics medium: sound. The deliberate analysis of lettering in some comics styles illustrates the oft-unheralded but crucial role of letterers and colorists in the medium’s aesthetics and in the comics industry. Klaus Kaindl points out in “Thump, Whizz, Poom: A Framework for the Study of Comics under Translation” (1999) that “[t]ypography as the technique of shaping characters is the interface between language and pictures” and that “proportion, size and extent can indicate the intensity of an emotion or a noise.” To these three elements I would add a fourth indicator: color. As Scott McCloud posits in Reinventing Comics (2000), “in relying on visual sequence, comics substitutes space for time.” In similar fashion, the multimodal language of comics sometimes substitutes color for sound tone in the rendition of speech. An excellent case in point of the chromatic representation of sound in comics can be found in the French comics series Asterix, where the “shape and color of speech balloons also contribute to the sound effect,” as Catherine Khordoc shows in “The Comic Book’s Soundtrack: Visual Sound Effects in Asterix” (2001). The following panels from artist Albert Uderzo and writer René Goscinny’s Obélix et compagnie (Dargaud, 1976), translated into British English by Anthea Bell and Derek Hockridge as Obelix and Co. (Hodder Dargaud, 1985), constitute a textbook example of some of the varied resources at hand for cartoonists to represent sound and give any desired or required nuance and depth to their narratives and characters, making up for the absence of an aural channel in comics with the multimodal resources of this hybrid medium. Fig. 1. Goscinny and Uderzo. Obélix et compagnie, Paris: Dargaud, 1976, pp. 27-28. In the original French album (Fig. 1), Uderzo plays with the chromatic representation of sound in lettering to make the words come “alive” (as Moebius would put it), and convey the characters’ mood. 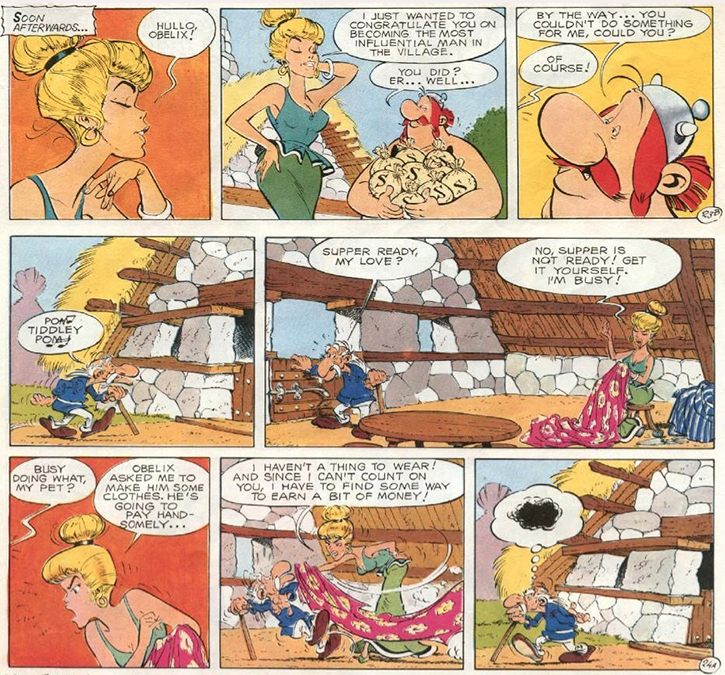 In the first two panels, Mrs. Geriatrix greets Obelix in a sweet and flirtatious voice, as suggested by the pink-colored letters (27). In contrast, Obelix’s voice (and the balloon lettering) remain consistent with the standard black color, representative of his natural nonchalance and utter lack of receptiveness to her charms. On the following page (28), Geriatrix (aka Arthritix in the US) heads home to his sweetheart ready for supper, only to find that it is not ready. Mrs. Geriatrix, visibly annoyed as deftly suggested by the green-colored lettering, replies that she is too busy for cooking and he might as well do it himself. Interestingly, the British translation, highly praised for rendering the linguistic ingenuity of Goscinny’s scripts but perhaps failing a minute semiotic perusal, does not maintain this chromatic distinction (Fig. 2). The lettering in all balloons remains monochrome, thus losing the sound tone of the original, although the pictures still convey, albeit partially, the semiosis. In subsequent panels, a visibly upset Geriatrix tells Asterix “[w]ell, my wife is making eyes at your friend!” (28). 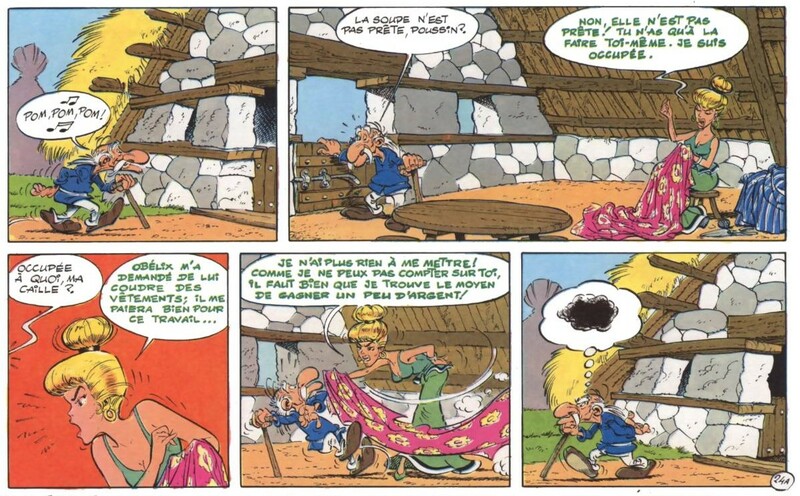 He also complains to the druid Getafix (aka Magigimmix or Vitamix in the US) that his “wife’s becoming a real sew-and-sew” (28), in Hodder Dargaud’s translation of the original “[…] ma femme me tance vertement!” (28) (literally, “my wife berates me” or “I am scolded sharply by my wife”), in a wordplay with “vertement” (sharply) and the green color (“vert” in French) used in the lettering. These examples show that even excellent translations––as Bell and Hockridge’s pun-laden Asterix albums certainly are from a linguistic and cultural viewpoint––will inevitably bring myriad changes to the original. Does this mean that the sound tone in the original was lost for British readers? Not entirely, as it is just conveyed differently. In the first panel’s speech balloon (27) Mrs. Geriatrix greets Obelix with a suggestive “Hullo, Obelix!” in contrast to the more linguistically standard French greeting “Bonjour Obélix!” (the semiotic connotation of the pink color notwithstanding). Conversely, the irritated tone used towards her alienated spouse Geriatrix (28) is not stressed by any particular speech marker, nor is it chromatically marked, perhaps because her words were deemed sufficient to communicate her anger in the (ostensibly) phlegmatic target culture and, doubtless—as noted by Jan Baetens in “From Black and White to Color and Back: What Does It Mean (not) to Use Color?” (2011)—because color is more often than not “neglected or seen as a less essential feature” of comics. Comics are, however, a unique medium with intrinsic qualities, such as the visual and chromatic representation of sound. As noted by Ken Parille in “Lichtenstein and the Art of Letters” (2017), the lettering functions as pictures, and “[p]art of comics’ pulp power resides not only in the words’ meanings but in their appearance, in the ways that their shapes interact with and echo other elements within a panel and on a page.” Comics translation should take into account hybrid elements, such as the chromatic representation of sound tones and color nuances in sound effects, that form an integral part of the (graphic) narrative. Does the unique semiosis of comics not call for an equally original, and multimodal, translational approach where—as Michał Borodo suggests in “Multimodality, Translation and Comics” (2015)—“the visual does compensate for the loss of the verbal”? Can comic book sound effects be patriotic? 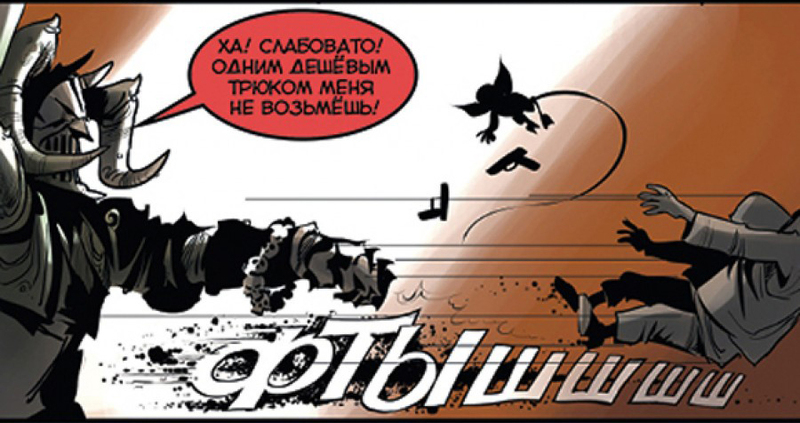 In August, 2015, the Russian newspaper Izvestia reported that representatives of the Moscow-based Center for Comics and Visual Culture (TsKVK) sent a letter to the Vinogradov Institute for the Russian Language proposing the creation of a dictionary of Russian comics sound effects. The letter read, in part, “As is well-known, in comics one may encounter an enormous quantity of onomatopoeic sound effects [zvukopodrazhanii]. How does one translate the sound of a telephone, the squeak of a door, the opening of a soda can, the rustle of a plastic ice cream wrapper, the sound made by a motorcyclist’s feet dragging along the ground? Most often translators simply replace the English letters with Cyrillic ones, as a result of which emerge the unpatriotic ‘beng,’ ‘kresh,’ ‘bems’ ‘vau,’ etc” (my emphasis). The center’s mission to “nationalize” Russian comics sound effects, with its echoes of Soviet-era practices to “bring the peoples together,” was met with some approbation by the Vinogradov institute – but widely ridiculed by the Russian comics industry and fans, who uploaded numerous mocking memes. These replaced the sound effects in various US comics (including Deadpool) with the proposed variants “galdyrdyms,” “chorkh” and “vababai,” to cutting comic effect. Online comments were no less sardonic, such as one user of LiveJournal, which is still popular in Russia, who posted: “Vababai, Kapiton! I almost duberdyms from my chair. Now I’m afraid to ssurchat’ tea.” Artyem Gabrielanov, of the mainstream publisher Bubble Comics, drily opined: “Onomatopoeic sound effects and interjections can’t be patriotic or unpatriotic. You won’t be taken seriously if you talk about using the exclamation ‘vababai’ instead of ‘vau’” (Korobkova). In short, the campaign proved little more than a laughingstock. …we (the Comics Center at the Russian State Youth Library) had [allegedly] approached the Institute of Russian Language with our initiative (even though we had done no such thing). Not only that, we didn’t even have any translators on our staff. … It also turned out that the journalist had lied to everyone, and that the professor in question had not made any sort of commentary [on this matter] at all. … [I] called him. He said that this was the first time he was hearing about all this. All this, though, does not alter the fact that the aforementioned ideological fault lines very much exist (as evidenced by the extensive and many-splendored online responses). Panel One Sound Effect: CHORKH, RRRRR. Dialog Translation: “And a big scary cat! Yo!” Panel Two Sound Effect: Ssurch. Panel Three Sound Effect: Vababai! Whether onomatopoeia are translated or not depends on the retouching effort, the genre and the target group. Translation strategies range from direct borrowing (sometimes with graphemic or phonological adaptation) to literal translations and category changes as well as to new creations of onomatopoeia (39). He goes on to offer this warning, of sorts: “[T]he font, for example, can express the nationality or political attitude” (39). As seen in the very particular setting of 21st-century Russia: can it ever. A country with a incomplete transition to representative democracy (to put it mildly), ruled by an oligarchy headed by a strongman who delivers to the population a newfound sense of the “superpower” greatness which vanished after the 1991 collapse of communism, moreover a country going through an era of repeated confrontation with both its former vassal states (Georgia, Ukraine) as well as the West, such a country will find offense in even the most minor, marginal and ephemeral of forms, such as comics. Please join us Thursday for the final installment of the Seeing Sounds / Hearing Pictures Round Table.